YHWH is given in the Bible as God's actual name. In most English Bibles it is translated as Lord, in small capitals. The name has various other English versions, including Yehovah, Jehovah, and Yahweh. The most likely meaning of the name may be "He Brings Into Existence Whatever Exists," but there are many theories and none is regarded as conclusive. God is the triune Supreme Being, the sovereign Creator and Ruler of the universe, the principal Object of the Christian faith. God is the eternal ruler of all things and beings that exist, whether in the physical universe or in the spiritual realm (Heaven). Not only is God the creator and ruler of the things and beings within those two realms, but he is also the creator of the realms themselves. God created the physical universe, and before he acted in this creation, the universe did not exist. Likewise God did with the spiritual realm. 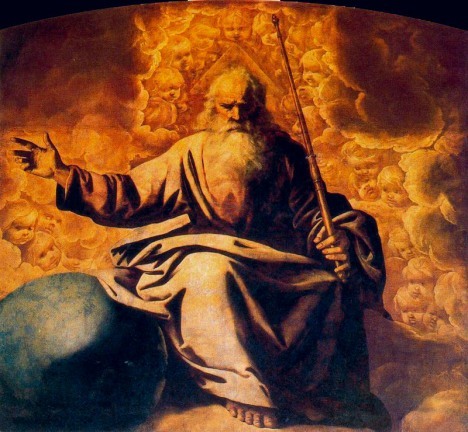 From the biblical viewpoint it is generally agreed that it is impossible to give a strict definition of the idea of God. This is because using finite language to define an infinite God quickly proves inadequate. God is the Alpha and Omega, the first and last, the beginning and the ending. God is also the Father, the Son, and the Holy Spirit. Attempts have been made, however, to give a definition for Who and What God is. Anselm said that God is "that than which nothing greater is conceivable" and that he is "the supreme Being." Yet, this does not begin to encompass what God has revealed of himself in the Bible regarding his existence, nature, character, purposes, and most significantly in the person of Jesus Christ. The study of God is theology. Other than creation itself, God is revealed in several ways, including conscience which testifies to us that certain things are wrong; and by special revelation through the Church; the bible and the prophets. Most importantly though, God is revealed in Jesus Christ, who is the Son of God. The Church teaches that we have knowledge of God, only because God has shown himself to his creation. God is the Lord and has revealed himself unto us; "blessed is he who comes in the name of the Lord" (Ps 118:26-27). Also, God's self-revelation is found in His Son Jesus Christ, the fulfillment of the gradual and partial revelation of God in the Old Testament. Jesus is the one truly "blessed ... who comes in the name of the Lord." The attributes of God are things that describe who he is. Similar to the way one might describe a close friend to another individual, so too do these attributes describe God's character and nature. Attributes of God include but are not limited to Wisdom, Infinitude, Sovereignty, Holiness, Trinity, Omniscience, Faithfulness, Love, Omnipotence, Self-existence, Self-sufficiency, Justice, Immutability, Mercy, Eternal, Goodness, Gracious, and Omnipresence. These attributes all work in complete and perfect harmony with one another. According to the Scriptures, and the experience of the saints of both the old and New Testaments, God is absolutely holy. This means literally that he is absolutely different and unlike anything or anyone else that exists. He is so unique and so perfect that his existence cannot be compared to any other existence. God is absolutely transcendent, "what he is, by essence and nature, is altogether beyond our comprehension and knowledge" (St. John of Damascus). 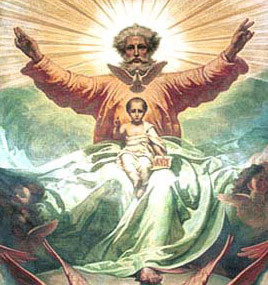 The Trinity is the term employed to signify the central doctrine of the Christian religion — the truth that in the unity of the Godhead there are Three Persons, the Father, the Son, and the Holy Spirit, these Three Persons being truly distinct one from another, each of whom 'dwells' in the other two, by virtue of a perpetual movement of love. God is not only a unity but a union. 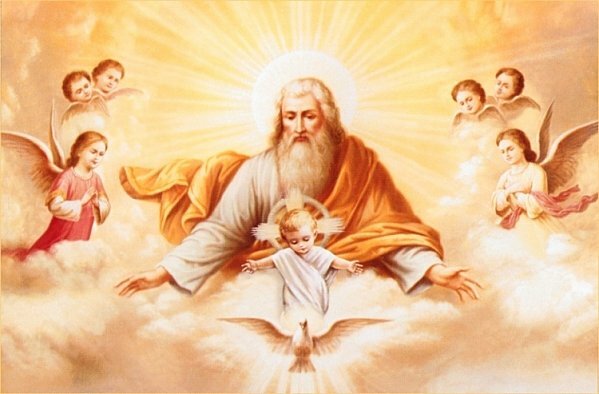 There is therefore nothing created, nothing subject to another in the Trinity: nor is there anything that has been added as though it once had not existed, but had entered afterwards: therefore the Father has never been without the Son, nor the Son without the Spirit: and this same Trinity is immutable and unalterable forever. - St. Gregory Thaumaturgus, P.G., X, 986. Just as the Father is "ineffable, inconceivable, invisible, incomprehensible, ever-existing and eternally the same" (Divine Liturgy of St. John Chrysostom), so the Son and the Spirit are exactly the same. Every attribute of divinity which belongs to God the Father: life, love, wisdom, truth, blessedness, holiness, power, purity, and joy, belong equally as well to the Son and the Holy Spirit. It is God, the Yahweh of Israel (the God of Abraham, Isaac, and Jacob), whom Jesus Christ has claimed to be his Father. God Almighty is known as "Father" through his son Jesus Christ. Jesus taught man to call the Almighty God by the title of Father. Before Jesus no one dared to pray to God with the intimate name of Father. It was Jesus who said, "Pray like this: Our Father who art in heaven ..."
"In the beginning was the Word, and the Word was with God, and the Word was God." - John 1:1This verse not only says that "the Word" (Jesus) is synonymous with God, but also says that the Word was "in the beginning", which means that He existed before all else existed, something that is only true of God. God is everywhere: The omnipresence of God is one of the divine attributes of the Creator particularly stressed in Church teachings. Loving the whole of his good creation, God dwells within the world that he has made because of his goodness and love for man. This is not to say that God "is" his creation, for he is more than that, God is above and outside his creation, yet he also exists within it. We don't know God by his essence and nature, but his energies come down to us. God's energies, which are God himself, permeate all his creation, and we experience them in the form of deifying grace and divine light. Truly our God is a God who acts in history, intervening directly in concrete situations. On the very first page of the Bible the absolute transcendence of God above His creatures comes to our attention. Without strain or fatigue He calls the whole world into existence by His word alone. By the word of the Lord were the heavens made, and all the host of them by the breath of His mouth (Ps. 33 :6). He speaks and it is done; He commands and it stands fast (Ps. 33:9). He does according to His will in the army of heaven, and among the inhabitants of the earth. And none can stay His hand, or say unto Him, what doest Thou (Dan. 4:35)? The nations are as a drop of a bucket, and are counted as the small dust of the balance: behold, He taketh up the isles as a very little thing. And Lebanon is not sufficient to burn, nor the beasts thereof sufficient for a burnt offering. All nations before Him are as nothing, and they are counted to Him as less than nothing, and vanity. To whom then will you liken God? or what likeness will you compare unto Him (Isa. 40:15-18). For who in the heaven can be compared unto the Lord? who among the sons of the mighty can be likened unto the Lord (Ps. 89:6). There is no name by which He can truly be named: His name is wonderful. When God speaks to Job out of the thunder and displays the magnitude of His works before him, Job humbly bows his head, and says: Behold, I am vile, What shall I answer Thee? I will lay my hand upon my mouth (Job 40:4). God is great, and we know Him not (Job 36:26). Such knowledge is too wonderful for us. It is high. We cannot attain unto it (Ps. 139:6). Nevertheless, this same sublime and exalted God stands in intimate all His creatures, even the meanest and smallest. What the scriptures give us is not an abstract concept of God, such as the philosopher gives us, but puts the very living God before us and lets us see Him in the works of His hands. We have but to lift up our eyes and see who has made all things. All things were made by His hand, brought forth by His will and His deed. And they are all sustained by His strength. Hence everything bears the stamp of His excellences and the mark of His goodness, wisdom, and power. And among creatures only man was created in His image and likeness. Only man is called the offspring of God (Acts 17:28). Because of this intimate relationship, God can be named in the terms of His creatures, and He can be spoken of anthropomorphically. The same Scripture which speaks in the most exalted way of God's incomparable greatness and majesty, at the same time speaks of Him in figures and images which sparkle with life. It speaks of His eyes and ears, His hands and feet, His mouth and lips, His heart and bowels. It ascribes all kinds of attributes to Him - of wisdom and knowledge, will and power, righteousness and mercy, and it ascribes to Him also such emotions as joy and grief, fear and vexation, zeal and envy, remorse and wrath, hatred and anger. It speaks of His observing and thinking, His hearing and seeing, His remembering and forgetting, smelling and tasting, sitting and rising, visiting and forsaking, blessing and chastising, and the like. It compares Him to a sun and a light, a fountain and a spring, a rock and a shelter, a sword and buckler, a lion and an eagle, a hero and a warrior, an artist and builder, a king and a judge, a husbandman and a shepherd, a man and a father. In short, all that can be found in the whole world in the way of support and shelter and aid is originally and perfectly to be found in overflowing abundance in God. Of Him the whole family in heaven and earth is named (Eph. 3.15). He is the Sun of being and all creatures are His fleeting rays. It is important, therefore, in this matter of the knowledge of God, for us to keep a firm hold on both of these groups of statements concerning the Divine being and to do justice to each of them. For, if we sacrifice the absolute transcendence of God above all of His creatures, we fall into polytheism (the pagan religion of many gods) or pantheism (the religion in which everything is God), two false religions which, according to the lesson of history, are closely related to each other and easily pass from the one into the other. And if we sacrifice the close relationship of God to His creatures, we go aground on the reef of deism (belief in God without benefit of revelation) or of atheism (the denial of the existence of God), two religions which, like those others, have numerous characteristics in common with each other. Scripture clings to both groups of characteristics, and Christian theology has followed in its wake. God actually does not have a name according to which we can truly name Him, and He names Himself and lets us name Him with many, many names. He is the infinitely Exalted One, and at the same time the One who lives along with all His creatures. In a certain sense all of His attributes are such as cannot be shared, and in another sense they are such as can all be shared. We cannot fathom this with our mind. There is no such thing as an adequate concept of God. There is no one who can give a definition, a delimitation, of God that is adequate to His being. The name which fully expresses what He is cannot be found. But the one group of characteristics outlined above does not conflict with the other. Precisely because God is the High and Exalted One, and lives in eternity, He also dwells with those who are of a contrite and humble Spirit (Isa. 57 :15). We know that God did not reveal Himself in order that we should draw up a philosophical concept of God from His revelation, but in order that we should accept Him, the true, living God, as our God, and should acknowledge and confess Him. These things are hidden from the wise and prudent, but they have been revealed to babes (Matt. 11 :25). The knowledge which we get of God by way of His revelation is therefore a knowledge of faith. It is not adequate, in the sense that it is not equivalent to the being of God, for God is infinitely exalted above all His creatures. Such knowledge is not purely symbolical either that is to say, couched in expressions which we have arbitrarily formed and which do not correspond to any reality; instead this knowledge is ectypal (ectype: an impression, as in printing) or analogical (analogy: correspondence or similarity in form) because it is based on the likeness and relationship which, notwithstanding God's absolute majesty, nevertheless exists between God and all the works of His hand. The Knowledge which God grants us of Himself in nature and in Scripture is limited, finite, fragmentary, but it is nevertheless true and pure. Such is God as He has revealed Himself in His Word and specifically in and through Christ; and He alone is such as our hearts require.